We had two ladies come in for 2 hours to clean the apartment of a friend with Parkinsons. They arrived on time and went above and beyond to leave it sparkling clean. My friend was ecstatic at how good a job they did. We will certainly get them back again in a few weeks, and would recommend them to others. Thank you to Oliver and the lovely ladies. They did a very thorough job. I got most of my damage deposit back. If I had retained them for 5 hours instead of 4, I’m sure I would have got it all back. Thanks. For your feedback !!!! I had them come in to clean once this summer and was unimpressed to say the least. I ended up having to clean the place again myself. When you clean a kitchen counter, try moving stuff, spray and wipe as opposed to cleaning around everything. Do it properly or don't bother. For the price I didn't get my money's worth at all. Never again. I have been using Green Maids every 2 weeks for 5 years now for my home and office. They are pros, always punctual, and always do a great job! They are trustworthy and I highly recommend them, in fact, I already have. Been using for many years. I tried many cleaning services before I found Green Maids. They are the best. I have been using them for many years now. They are friendly, nice people, punctual and trustworthy. They do a very good job. Whenever I call they fit me in and come right away. I get 2 people for around $115 for 2 hours. I usually with with Umberto and he is just great. I would recommend them. Thanks for your business. We are glad to serve you. Had my apartment cleaned by this company, They did a great job. Everything looked brand new. I would absolutely recommend them to a friend or family member who doesn't have a lot of extra time to deep clean. I have been using Green Maids service for 3 years now for my home and office. They come every 2 weeks for 30 mins and charge $95 per visit. They are great! I'm at the office when they do my home and at home when they do my office, so needless to say they are very trustworthy and reliable. I would highly recommend. Thank you Jeff for your business and the review. Very happy with the service. They were flexible throughout, and cleaned up a gnarly carpet. Their ozone machine destroyed the smell of the smoke in the room, although it took an extra day. They let me keep the machines for the extra time, no question asked. Have used them before, we'll use them again. Thank you for the review and your business Dan. I hired Green Maids to clean my condo In Vancouver On May 31. I made a last minute call and they took my request and did an excellent job!!!!! I strongly recommend this company for everyone, good prices and excellent customer service..
Green Maids Canada cleaned my house from top to bottom. I thought the job done was good and I found out and heard about this company online. They were punctual and there is nothing more that I wish they could have done for me! Thanks Jennifer for us is always a pleasure clean you house. Green Maids Canada is a local company operating since 2005 in Vancouver. We provide Residential, Commercial and Carpet Cleaning using green products. Our people is bonded and we have high standard quality services for our clients. 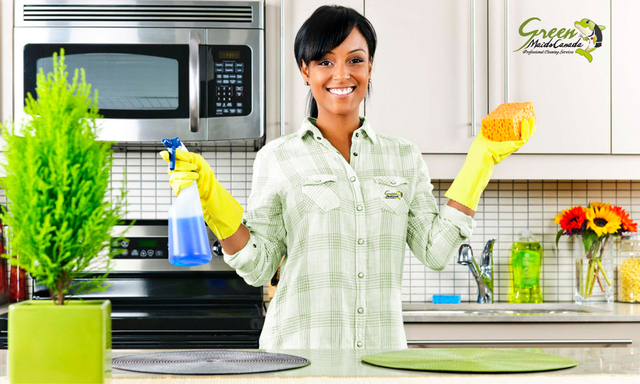 Green Maids Canada is highest rated cleaning service. Our friendly & professionally employed cleaners are background-checked, insured & bonded, and bring eco-friendly supplies! We'll have your home or apartment spotless in no time — 200% Happiness Guaranteed! If you're unhappy with your cleaning for any reason, simply let us know and we'll re-clean for free!. We offer regular house cleaning, move out cleaning, office cleaning, janitorial service, building maintenance and carpet cleaning. We work in Vancouver, Burnaby, North Vancouver, West Vancouver, Richmond, New Westminster, Surrey, Delta, Langley, Coquitlam, Port Moody, Pitt Medows and Maple Ridge. We are Specialize in Green House Cleaning, Office Cleaning, Carpet Cleaning and Move Out Cleaning.